Beautiful sinks! Would totally recommend! The Kraus Nature Series reflects a move toward designs influenced by Earth's elemental beauty. Handcrafted from tempered glass by skilled artisans, each of the vessel sinks is a functional work of art that complements the transitional and modern bathroom alike. A freestanding basin design creates a dramatic look with contemporary appeal. Inspired by the lush green palette of a rolling hillside, the Nei bathroom sink looks striking in a monochromatic setting or a clean, modern space. Vessel installation offers an easy top mount option for all your stylish bathroom ideas. Pair it with a waterfall faucet with matching glass disk for additional value, and create an instant style upgrade for less. Sink Dimensions: 17" x 6"
Dimensions 30.0 In. X 20.0 In. X 10.0 In. I purchased this Vessel sink with waterfall. Even though not installed yet, it is so amazing gorgeous. Great price and very well made. Would highly recommend. Beautiful color. This is my second Kraus vessel sink. The color in this is really beautiful. Well made, quality product. Purchased two of these for a double vanity and it really makes the bathroom pop. Gorgeous! Many compliments. Beautifull, solid. Adds touch of tropics to the bathroom. Just stunning, my husband and I both love it. 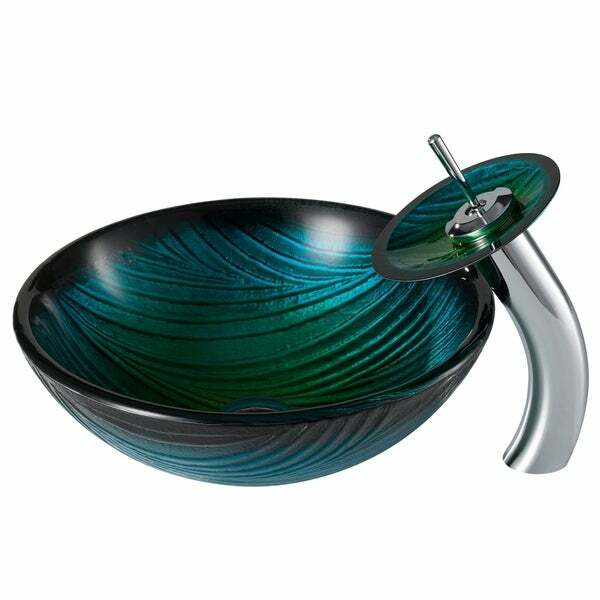 because it is striking and include waterfall faucet in my choice of finishes. I loved the color gradation and swirls. And the price was very good. I had purchased a Kraus vessel sink 7 yrs ago. The valve went bad in the waterfall faucet. I decided to change out the vessel sink rather than replace the faucet with a new one. I love the colors and the impact this sink has. Like the old one I'm sure this one will make a statement as well.